The Indian navy chief, Admiral Devendra Kumar Joshi, resigned today after a fire accident on board a navy submarine, INS Sindhuratna, injured seven sailors and left two officers missing. “Taking moral responsibility for the accidents and incidents which have taken place during the past few months, the Chief of Naval Staff Admiral DK Joshi today resigned from the post of CNS. The Government has accepted the resignation of Admiral Joshi with immediate effect,” the defence ministry announced today. Vice Admiral RK Dhowan, the navy’s vice chief and Admiral Joshi’s deputy, has been asked to take over as acting navy chief until a permanent incumbent is announced. “It is in the best traditions (of the Indian Navy) that he has owned responsibility”, said Admiral Sureesh Mehta, a former navy chief. This is the first time that an Indian military chief has resigned for professional lapses by his service. That satisfaction was not shared by Defence Minister AK Antony, who told top navy commanders last year that, "it is the responsibility of the Navy to optimally operate and maintain (warships), as well as train its personnel suitably so that such national resources are optimally utilised and are not frittered away." The incident took place ironically whilst the navy’s submarine inspection team was on board, checking safety and other procedures. The navy’s Commodore Commander, Submarines, or COMCOR, its top safety inspector was also on board. “While at sea in the early hours of 26 Feb 2014, smoke was reported in the sailors accommodation, in compartment number three, by the submarine. Smoke was brought under control by the submarine's crew,” stated the navy today, understating the gravity of the incident. 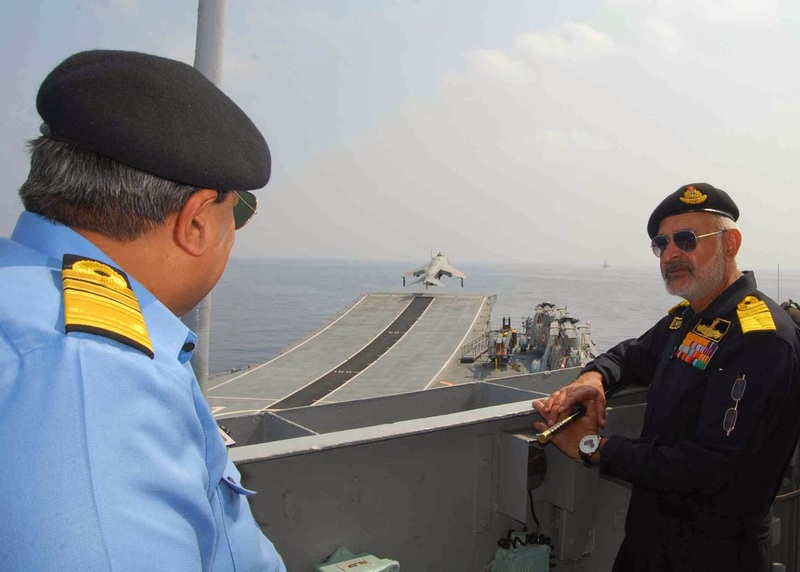 According to the navy, INS Sindhuratna was carrying out “routine training and workup”, which is standard procedure after a major refit (maintenance). For that reason, the submarine did not have any weapons on board. 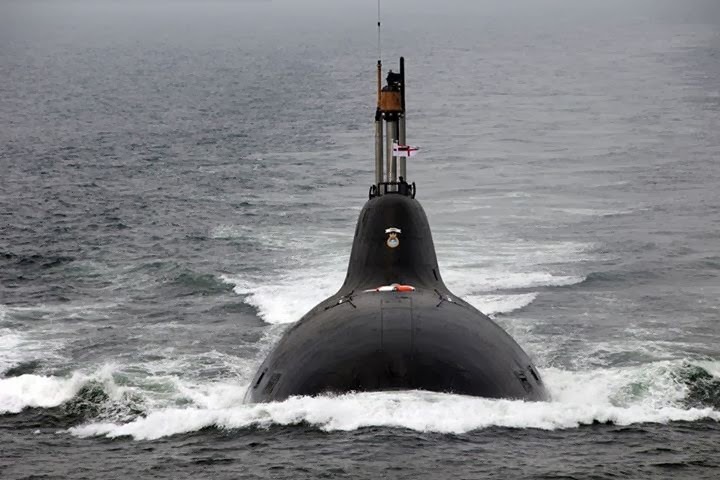 In the last seven months, India’s submarine fleet has been worryingly depleted from its already low strength of 14 submarines, of which no more than 10 were operationally available at any given time. On August 14, 2013, INS Sindhurakshak, sank in Mumbai harbour after an explosion killed all 18 crew members on board. A second submarine, INS Sindhughosh, which was parked alongside Sindhurakshak, was damaged in the fire; the navy has released no details. Four years earlier, the Sindhughosh had collided with a merchant vessel while surfacing off the off the coast of Mumbai. The INS Sindhuratna itself was involved in a minor accident a few years ago, when a tug that was towing it collided with INS Sindhukesri, damaging the latter’s rudder. Now, with INS Sindhuratna incapacitated, the navy cannot field more than 8-9 submarines in a crisis. The question marks over the navy’s safety culture extend also to the surface fleet. In January 2011, the 2,700-tonne frigate, INS Vindhyagiri, the former flagship of the western naval fleet, sank in Mumbai after colliding with a merchant vessel. In December, a day after the navy chief dismissed safety concerns, a minesweeper, INS Konkan, was gutted in a major fire whilst in Visakhapatnam harbour. Days later, one of the navy’s most modern frigates, INS Talwar, collided with a fishing trawler off Ratnagiri, sinking the latter. The warship captain was later relieved of command. Several other naval warships have been damaged in incidents over recent years. Even as India increases the size of its army by close to 1,50,000 soldiers, raising uncomfortable questions of how it will finance equipment modernization, the United States is cutting its army to the smallest size since before World War II in order to equip and train it adequately. According to the Pentagon’s new spending proposals, the end of the Iraq and Afghanistan wars and a sharply reduced defence budget force manpower to be slashed to retain funding for maintaining America’s military technological edge. The New York Times, which has broken the news ahead of a report that it says will be made public on Monday, says that America’s land forces will be reduced from a post-9/11 peak of 570,000 to about 440,000 in the coming years. America, however, will maintain its ability to project power across the globe. It will retain 11 aircraft carriers that are spread across the world, and the US Navy will continue to purchase two destroyers and two attack submarines every year. The controversial F-35 fifth generation strike aircraft, which has faced time and cost overruns, will continue to get funding. The legendary U-2 spy plane, which performed reconnaissance missions over enemy territory by flying higher and faster than any fighter aircraft in service, will be retired; the unmanned, remotely piloted Global Hawk will replace the U-2. Providing an opportunity for India, the US Air Force is retiring its entire fleet of A-10 Warthog ground strike aircraft. Bristling with cannons, rockets, bombs and air-to-surface missiles, this armoured aircraft was specially designed to provide fire support to army soldiers on the battlefield. During both Gulf Wars against Iraq, the A-10 was the nemesis of Iraqi tanks. “Whether in the mountains, or against enemy tank forces, the A-10 would dramatically boost the Indian Army’s combat power”, says a senior serving general. 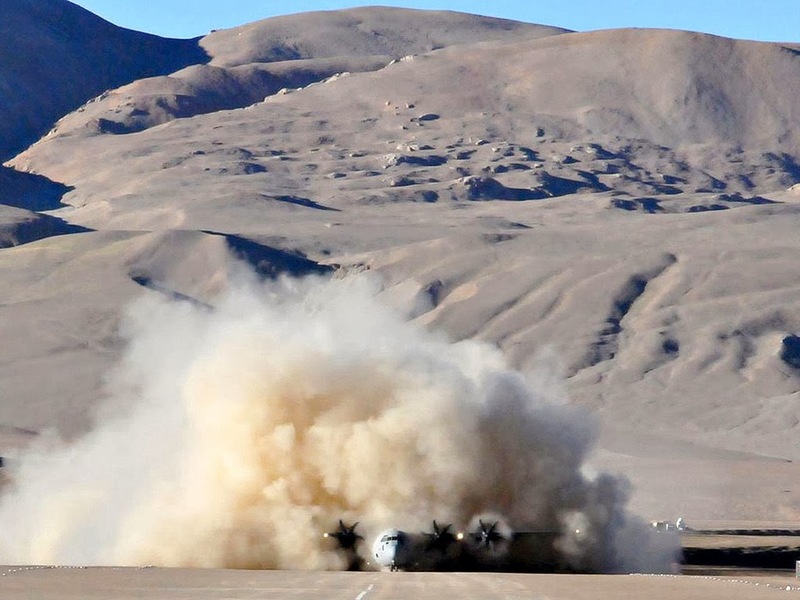 The army increasingly believes that the Indian Air Force (IAF) is focusing more on tackling enemy air forces rather than on supporting the army on the battlefield. Emphasising the changing nature of warfare, the new Pentagon plan, which carries the imprimatur of Secretary of Defence, Chuck Hagel, protects funding for Special Operations Forces and for cyber warfare. 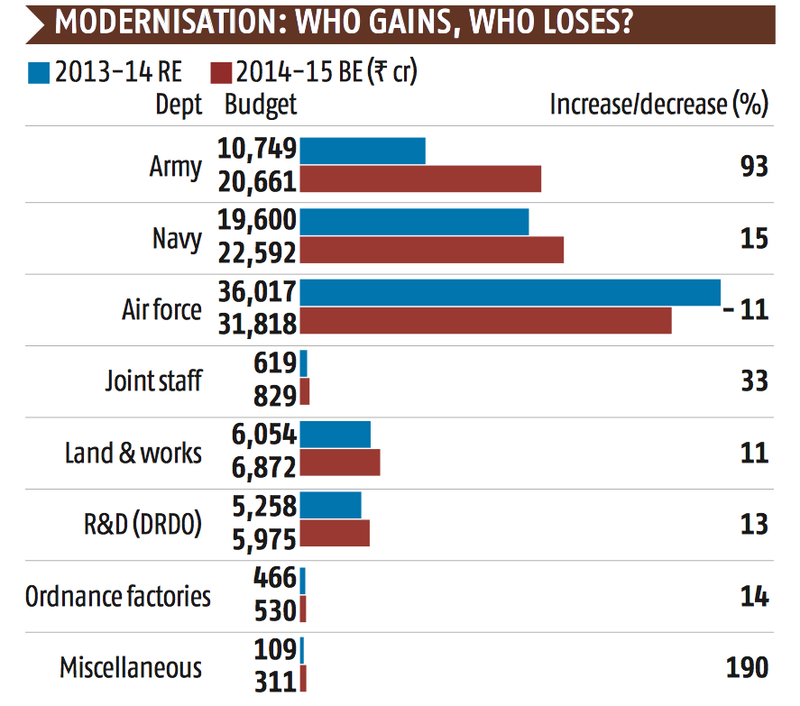 The budget cuts that necessitate this restructuring stem from the Bipartisan Budget Act of December, which caps military spending at $496 billion for 2015 (India has allocated $36 billion on defence in 2014-15). 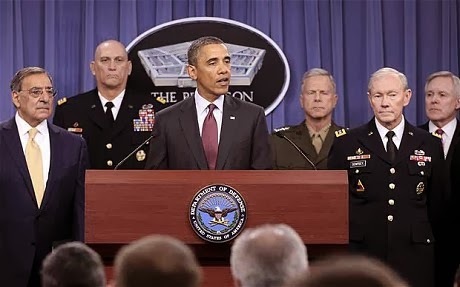 The US military could see even deeper cuts in 2016, if the sequestration law kicks in. The budget has been ruthless on personnel spending, imposing a one-year salary freeze for generals and flag officers. Military personnel will have to make do with a salary rise of 1 per cent; and face reduced subsidies for housing and daily living. In contrast, the Indian army, in the interim budget presented on February 17, has retained its bloated personnel costs --- spending more than two-thirds of its revenue budget on salaries. This is set to increase once the 7th Pay Commission inevitably raises entitlements. 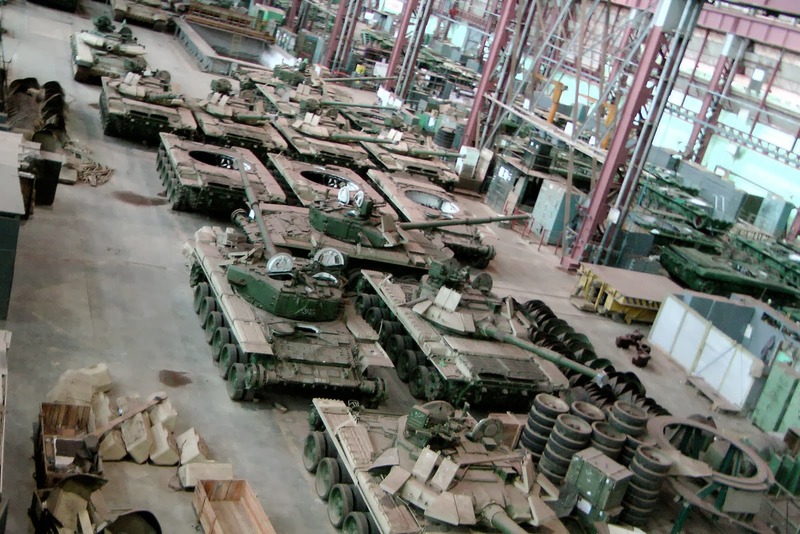 For over four decades, Russia has been India’s largest arms supplier by a comfortable margin. Last year, the United States overtook Russia to grab that spot. According to the defence and security analysis group, IHS Jane’s, India has also supplanted Saudi Arabia as the world’s biggest buyer of American weaponry. In 2013, India imported $1.9 billion worth of US equipment, including the C-17 Globemaster III and the P-8I multi-mission aircraft. Defence equipment imports from the US have shot up from just $237 million in 2009, to 8 times that figure last year. And, with several high-value US contracts in the procurement pipeline --- including a $600-700 million purchase of 145 M777 guns; additional C-130J Super Hercules and C-17 Globemaster III aircraft; and a possible billion-dollar buy of 8,400 Javelin anti-tank missiles --- this is poised to rise even higher. According to Indian analysts, the defence ministry in New Delhi is increasingly comfortable buying weaponry directly from the US department of defence (the Pentagon), partly because of the perception that this provides no space for corruption and arms agents. An increasing number of US contracts, such as those for C-17 aircraft and the M777 gun, are being routed through America’s Foreign Military Sales (FMS) programme, in which the Pentagon negotiates the rates and supply schedule with the vendor, on behalf of the buyer. In 2010, India had overtaken China as the world’s biggest importer of defence equipment, according to the Stockholm International Peace Research Institute (SIPRI). Last year, total arms deliveries to India (as opposed to the value of contracts signed) touched $5.9 billion. Almost half of India’s $13.4 billion budget for equipment modernization was spent on foreign weaponry. Saudi Arabia was in second place with $5.4 billion in arms imports. For decades, India’s Russian-equipped military had continued their reliance on Russian spares, upgrades and maintenance. But now, a new generation of equipment is entering service with the Indian military, and Russia is winning only a limited share of those contracts. According to IHS Jane’s, the US narrowly beat out Russia as the world’s biggest arms exporter in 2013. America exported $25.2 billion worth of defence equipment last year, compared to $24.9 billion exported by Russia. 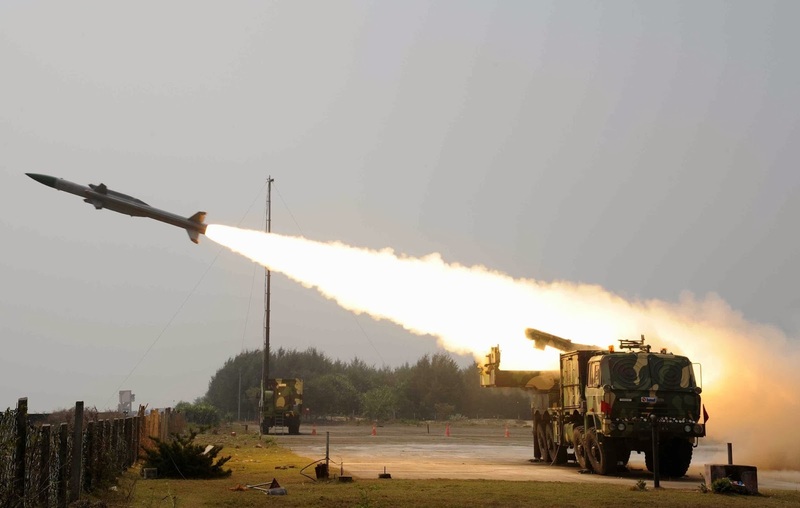 The Defence R&D Organisation (DRDO) has announced a successful test for the Indian Army version of the indigenously designed, developed and produced Akash surface-to-air missile. According to the DRDO, the test, which was conducted at the Integrated Test Range (ITR), Chandipur, was part of a series of trials being conducted in various engagement modes from the first Production Model Akash systems. These will equip two regiments of the Indian Army. Today's test flight destroyed a target in receding mode. An earlier test conducted on 21st Feb 2014 destroying an approaching target. The DRDO says, "both (tests) fully met the mission objectives and few more trials are planned in different engagement modes." The Akash is capable of engaging aerial threats up to a distance of approximately 25 kms. The multi-target, multi-directional, all-weather air defence system consists of surveillance and tracking radars, control centres and ground support systems mounted on high mobility vehicles for the “Army” version of Akash. It will be integrated with the army's air defence command and control networks through secured communication links. Developed by DRDO, the army version of Akash is being produced by Bharat Dynamics Limited (BDL), with the involvement of Bharat Electronics Limited (BEL) and a large number of other industries. The total production value of Akash air defence systems cleared for induction by Indian Army and Indian Air force is more than Rs 23,000 crore. Beneath the bland 10 per cent rise in defence allocations in the interim budget presented in Parliament on February 17 is the uncomfortable reality that Indian defence spending will touch a 52-year low in 2014-15, in terms of percentage of Gross Domestic Product --- 1.74 per cent of GDP this year, and 12.7 per cent of government spending. The last time defence allocation was lower was 1962, when the military got 1.5 per cent of the GDP, in keeping with the trend through the 1950s. The Chinese attack in October 1962 led to emergency imports, raising defence expenditure to 2.32 per cent that year. Since then, this year’s allocation is the lowest. Meanwhile, the US and Russia spend around four per cent of GDP on their militaries, the UK and France spend 2.3 to 2.5 per cent, Pakistan spends close to 3 per cent, and China declares an expenditure of slightly over 2 per cent, but is believed to actually spend 3 per cent if hidden funding is included. Ironically, India’s spending cut coincides with an effort to boost capability on the China border. But while the army’s modernization budget has almost doubled, the air force (IAF) --- traditionally the biggest spender on modernisation --- has seen funding slashed, endangering its multi-billion dollar plan to purchase 126 French Rafale medium multi-role combat aircraft (MMRCA). The army, which is raising a mountain strike corps for the Himalayan border, has received enhanced revenue funding for recruiting and salaries for some 80,000 additional soldiers. 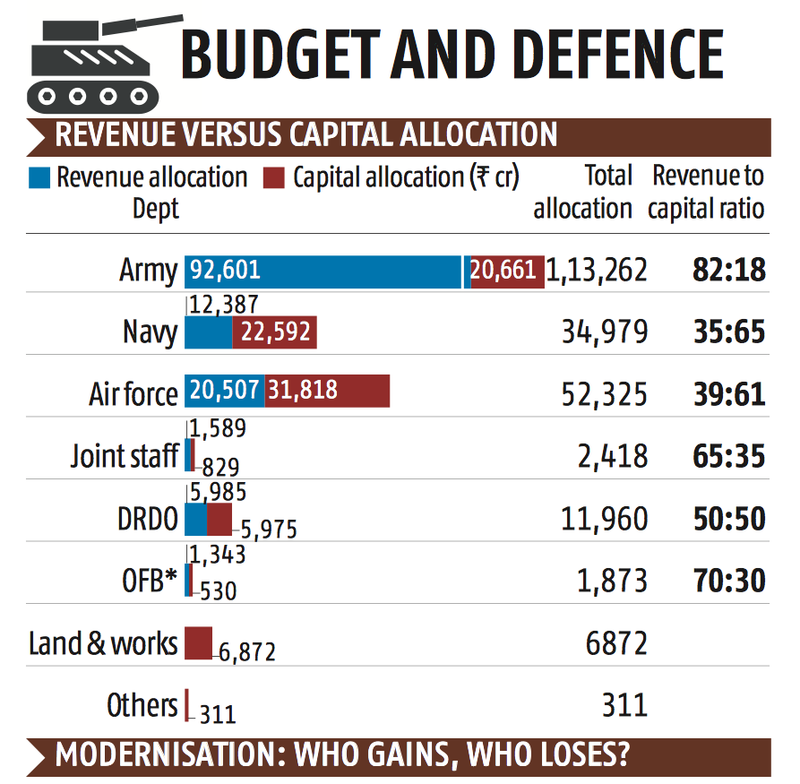 Simultaneously its capital budget will rise --- from Rs 10,749 crore this year to Rs 20,661 crore in 2014-15 --- for buying weaponry to equip the new corps, including rifles, machine guns, artillery, helicopters and communications equipment. The cabinet had cleared Rs 64,000 crore for this, which will be required over the coming 8 years. 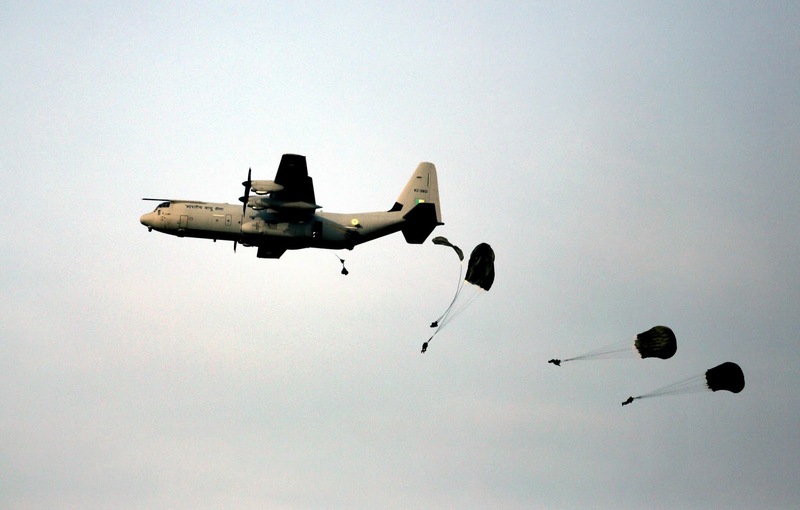 The army has gained at the cost of the equipment-intensive IAF. 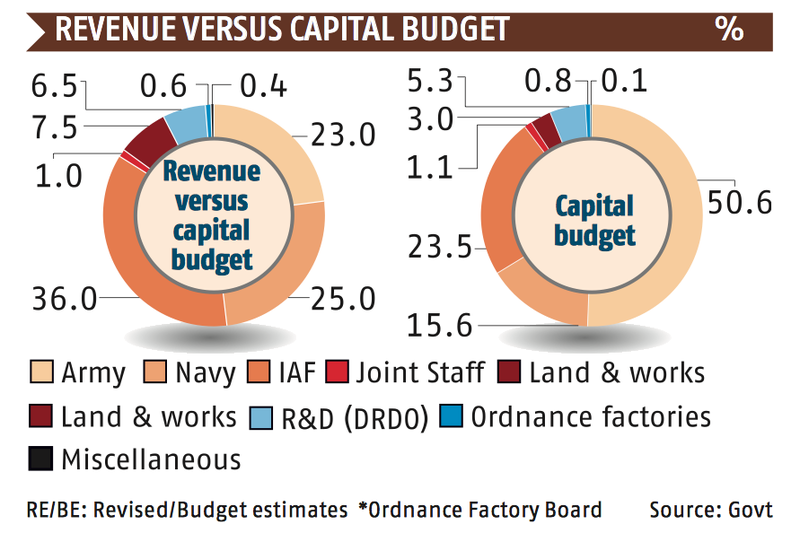 While the air force has again been given the lion’s share of the capital budget, its allocation has been trimmed to Rs 31,818 crore, which is Rs 4,199 crore less than the current year’s modernisation budget. This will pose serious problems for the IAF’s drive to seal the Rafale contract with Dassault. With the contract value estimated at $16-20 billion, the IAF would have to pay Rs 10,000-15,000 crore as advance while signing the contract. Given the IAF’s pre-committed capital expenditure --- i.e. instalments on equipment bought during preceding years --- this year’s reduced budget will make it difficult to fund such a massive pay out. Meanwhile, the IAF’s burden of pre-committed payments has reduced somewhat after the MoD’s termination of the Rs 4,650 crore contract with AgustaWestland for VVIP helicopters, following corruption allegations. But heavy instalments will continue for several years from the Rs 26,000 crore purchase of ten C-17 Globemaster III transport aircraft; the Rs 6,000 crore purchase of six C-130J Super Hercules transports. The IAF also faces difficult choices between a host of impending purchases; besides the Rafale, contracts are also impending for 22 AH-64 Apache attack helicopters and 12 CH-47F Chinook multi-mission helicopters, together worth some Rs 12,000 crore; a Rs 15,000-18,000 crore deal for new Honeywell engines for the IAF’s Jaguar strike aircraft; and the on going purchase of Sukhoi-30MKI and Tejas Mark I fighters that are being built and supplied by Hindustan Aeronautics Ltd.
Of the overall defence budget, the army will get about half (see chart); the IAF will get a little short of a quarter, while the navy’s share reduces marginally to 15.6 per cent. The two smaller services remain far better modernisers than the army. Both spend about two-thirds of their money on new equipment (capital expenditure). The army --- which remains a manpower-intensive, low technology force --- uses less than one-fifth of its budget for modernisation. Defence Minister AK Antony has not backed his frequent public exhortations for indigenisation with money. The Defence R&D Organisation (DRDO), which has long argued for at least 7 per cent of the budget to boost indigenisation, will get its customary 5 per cent. About half of that will be used for actual R&D. The defence allocations starkly highlight the marginal role of tri-service jointmanship. A token Rs 2,418 crore --- one per cent of the defence budget --- is allocated for tri-service organisations like the headquarters of the integrated defence staff (IDS) and the Andaman & Nicobar Command (ANC). India’s only tri-service operational command, based in Port Blair, remains an outpost that is noticed more by Southeast Asian countries than by New Delhi. The interim defence budget, which raises military expenditure by 10 per cent from the current 2,03,672 crore to Rs 2,24,000 crore for 2014-15, is merely a fiscal bridge until the incoming government presents a final budget. With growth less than 5 per cent, the United Progressive Alliance has tried to signal that it is strong on national security. Yet, defence allocations remain below 2 per cent of GDP, a low figure given India’s two-front threat perception from China and Pakistan, and its internal security challenges in J&K, the northeast and in the Naxal belt. The figure looks better --- close to 3 per cent of GDP --- if one adds spending on defence pensions, nuclear forces and central armed police forces (CAPF) --- which include organisations like the Central Reserve Police Force and the Border Security Force that play essential roles in internal security. Finance Minister Chidambaram, again strumming the “strong-on-security” chord, announced the allocation of Rs 11,009 crore for modernising the CAPF. This is welcome, given that the CAPF’s heavy-handedness (and that of the J&K Police) in handling public protests in J&K in 2009 and 2010 created a national security crisis. Directly courting a restive ex-servicemen community, which is also being wooed by the BJP, the government acceded to a longstanding demand for “One Rank One Pension”, or OROP. This entitles soldiers, sailors and airmen who retired before 2006 --- when the 6th Pay Commission raised salaries and, therefore, pensions --- the higher pensions drawn by more recent retirees for the same length of service. This concession was not surprising since Rahul Gandhi had virtually promised OROP to a group of army pensioners he met last Friday. Through OROP, the government has reached out to a constituency of 1.26 crore people, if one counts 14 lakh serving soldiers, 24 lakh pensioners, and a family unit of four for each. The government has long opposed OROP because full and retrospective implementation would require a one-time pay out of Rs 3,000-4,000 crore for arrears since January 1st, 2006; and also an annual hike of Rs 2,000 crore in the pension budget. To minimise the financial impact, the government has dispensed with the arrears, garnering the goodwill while handing the tab to the next government. While allocating only Rs 500 crore for OROP, the separate defence pensions allocation has been raised substantially, from 45,500 crore this year to Rs 50,000 crore in 2014-15. Defence pensions are not paid from defence allocations, but this rising figure is a reminder that growing manpower costs are blocking force modernisation. In 2013-14, just 42 per cent of the budget (it should be 60 per cent) was earmarked for modernisation, with 58 per cent reserved for running costs. After Rs 7,868 crore were diverted in December from the capital to the revenue account, modernisation expenditure will fall to just 38 per cent this year. The 2014-15 defence budget also allocates 42 per cent to modernisation, a sum of Rs 92,601 crore. But the decision to raise a mountain strike corps for the China border, which will add 80,000 soldiers to India’s already bloated 13,73,678-man military, could again result in money meant for weaponry being eventually spent on salaries and pensions. Each year, equipment modernisation is blunted by predictable events; the same patterns dealing double and triple whammies to capital spending. Firstly, contracts concluded during preceding years build up instalments that must be paid, and which are known in advance. This year, the army was to pay more than Rs 64,680 crore --- 92 per cent of its capital allocation --- on pre-committed expenditures, leaving it with just Rs 2,955 crore for new contracts. But capital allocations have ignored this trend, leaving less and less each year for new weaponry. Secondly, capital expenditure is hit by any decline in the rupee. Since capital expenditure, including instalments for equipment bought during previous years, is denominated in foreign currency, any fall in the rupee upends the calculations. Thirdly, in a cosmetic exercise to reduce revenue spending, the government has shifted the purchase of several items from the revenue to the capital account. These include new aero engines, spares for in-service aircraft, and several categories of trucks and vehicles. This jugglery does indeed reduce revenue expenditure, but also leaves less in the capital account for the purchase of capital weapons platforms that actually add to combat power. Finally, the most worrying aspect of defence budgeting is that the military’s long-term equipment planning is based on fundamentally flawed fiscal assumptions. Crucial planning documents, like the Long Term Integrated Perspective Plan (LTIPP) and the Five-Year Procurement Plan, envision the purchase of equipment worth lakhs of crores of rupees, without any sign of the money being available. Without a tri-service chief to take ownership of the planning process, the LTIPP assumes high GDP growth that has long ago slowed; a stable foreign exchange situation; it barely caters for inflation; and assumes defence allocations of about 3 per cent of GDP, while actual allocations are barely 2 per cent. With the basics so out of sync with reality it is hardly surprising that, year after year, spending is further out of line with planning and that budgeting is merely an activity done in February that is long forgotten by December. India and China are poised to begin a bilateral dialogue on maritime security, one of the most high profile subject areas in the growing Asian rivalry. This was decided at the 17th round of talks on February 10-11, between National Security Advisor Shivshankar Menon and China’s State Councillor Yang Jiechi, the Special Representatives of India and China respectively on the boundary question. Both governments believe that the common maritime interests, such as the uninterrupted supply of hydrocarbons for both countries’ energy security, outweigh any naval rivalry. Neither side believes that it has the military power to exercise uncontested control over the waters in its proximity --- the Indian Ocean for India, and the South and East China Seas and the Eastern Pacific for China. This initiative will gain moment in the forthcoming Annual Defence Dialogue, which is scheduled for February 24. China’s deputy chief of defence staff will be coming to Delhi to discuss military cooperation, including the scheduling of joint military operations. Simultaneously, China has rejuvenated its proposal for creating a “maritime silk route” that would link the Indian and Pacific Oceans, visualizing the region as an arena of cooperation and commerce, rather than strategic contest. First proposed by President Xi Jinping last October, China has set up a 3 billion Yuan ($495 million) fund to support the idea. Yang brought up the idea during the Special Representatives dialogue, and Beijing has raised the subject this week with the Sri Lankan president who is visiting China. The spokesperson of China’s foreign ministry promised “exciting items on this year’s agenda of China-India relations,” after the Special Representative talks. Beijing has proposed a high-profile celebration of the 60th anniversary of the 1954 Panchsheela Agreement, which has become a global yardstick for bilateral agreement, even though the actual treaty was not favourable to India. China has also suggested a high-level visit for the second half of this year, preferably at the level of president or vice-president. The two prime ministers exchanged visits in 2013, the first time since 1954 that this happened in a single year. On two occasions, Prime Minister Manmohan Singh met President Xi Jinping. The agenda for the Special Representatives has expanded over the preceding decade from its original mandate, proposed in 2003, of negotiating a political settlement to the territorial and boundary dispute. The Special Representatives --- on India’s side these were Brajesh Mishra, then JN Dixit, then MK Narayanan and currently Shivshankar Menon --- gradually began discussing measures for ensuring peace and tranquillity on the line of actual control (LAC); the regional and global situation; and have now begun discussing the strategic relationship as well. Also on the anvil now is a Code of Conduct for troops that come into contact while patrolling on the LAC. This has been proposed by Beijing, which was apparently startled by the outrage in India after a Chinese patrol established camp on disputed territory at Depsang, in Ladakh, last April. 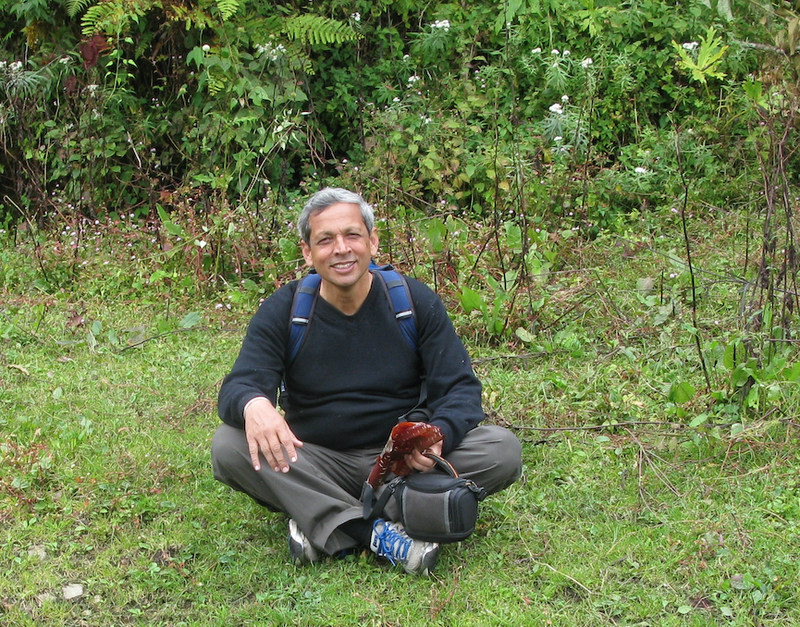 New Delhi is evaluating the Chinese suggestion. India’s own fighter, the Tejas Light Combat Aircraft (LCA), is playing a growing role in protecting Indian airspace. On December 20, when the Tejas was cleared for operational service in the Indian Air Force (IAF), Defence Minister AK Antony declared that 200 Tejas fighters would eventually enter combat service. Today, that figure quietly swelled to well above 300, with the government indicating that the IAF would have at least 14 Tejas squadrons. Each IAF combat squadron has 21 fighter aircraft; 14 squadrons add up to 294 Tejas fighters. The 21 fighters include 16 frontline, single-seat fighters, 2 twin-seat trainers and 3 reserve aircraft to make up losses in war. So far, the IAF has committed to inducting just 6 Tejas squadrons --- 2 squadrons of the current Tejas Mark I, and 4 squadrons of the improved Tejas Mark II. In addition, the navy plans to buy some 40-50 Tejas for its future aircraft carriers. Since the Tejas programme began in 1985, about Rs 7,000 crore have been spent on the Tejas Mark I, which obtained Initial Operational Clearance in December, allowing regular IAF pilots to fly it. By the end of this year, when it obtains Final Operational Clearance, it would have consumed a budget of Rs 7,965 crore. An additional Rs 2,432 crore has been allocated for the Tejas Mark II, which takes the total development cost of the IAF variant to Rs 10,397 crore. Separately, Rs 3,650 crore were sanctioned for developing the naval Tejas, which is ongoing. That means the Aeronautical Development Agency will spend Rs 14,047 crore on the entire Tejas programme, including the IAF, naval and trainer variants. Hindustan Aeronautics Ltd, which manufactures the Tejas, has quoted Rs 162 crore per fighter as its latest price. Amortising the entire development cost on the envisioned 344 fighters (IAF: 294; Navy: 50), the Tejas would cost Rs 209 crore ($33.5 million) per fighter. In comparison, the IAF’s Mirage 2000 fighters, which were bought in the 1980s, are currently being upgraded for $45 million per aircraft. 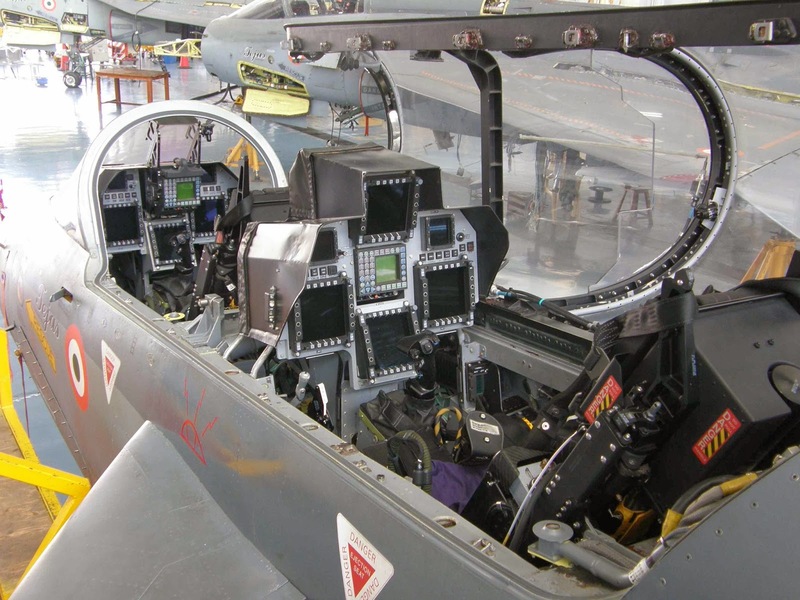 IAF pilots that test-fly the Tejas Mark I find it qualitatively superior to the Mirage 2000. The heavier Sukhoi-30MKI costs more than Rs 400 crore ($65 million) each. And the Rafale, which is currently being negotiated with Dassault, is pegged at Rs 750-850 crore ($120-140 million) per fighter. Aerospace expert and historian, Pushpindar Singh, points out that ordering more Tejas would bring down the price further, making it enormously attractive for air forces across the world that are replacing some 3,500 MiG-21, Mirage-III, early model F-16 and F-5 fighters that are completing their service lives. “With these air forces facing severe budget pressures, the Tejas has only one rival in this market --- the JF-17 Thunder, being built by China in partnership with Pakistan. They are marketing the JF-17 aggressively in every global air show, but India is completely ignoring the Tejas’ potential,” notes Singh. British defence and aerospace giant, BAE Systems, has offered assistance in modernising the countrywide network of 41 factories in which the Ordnance Factory Board (OFB) manufactures weaponry, ammunition and equipment for the defence forces. The OFB is owned by the ministry of defence (MoD). In 2011-12, OFB factories produced Rs 12,391 crore worth of equipment for the military, with an import content of just 9.82 per cent. Yet, with the oldest of them dating back to 1801, and 8 factories over a hundred years old, an opportunity has been sensed by BAE Systems, which has spearheaded the modernisation and transformation of the UK’s Royal Ordnance Factories since 1987. Although OFB has invested steadily in modernisation and expansion, and has increased output from Rs 6,938 crore in 2007-08, to Rs 12,391 crore in 2011-12, it is hard pressed to meet growing Indian demands for defence equipment. Besides the military, the OFB must also supply central armed police forces like the CRPF and the BSF. With OFB capacity insufficient for meeting domestic demand, arms exports languish. Senior government officials say this is a key reason for New Delhi being unable to supply arms for the Afghan National Security Forces, even though this was requested personally by Afghan president, Hamid Karzai. Senior OFB officials confirm the BAE Systems offer, but say they would evaluate how that might synergise with the OFB’s own detailed modernisation plans. Sartaj Singh, the OFB Chairman, told Business Standard that the OFB would not hesitate to join hands with a foreign partner if there is a clear technological advantage. The OFB chairman claims the technology that goes into these systems --- such as electro-slag refined steel, radial forging and auto-frettaging of barrels --- is as good as any arms manufacturer in the world. According to figures provided by the MoD to the Standing Committee on Defence, the OFB will spend Rs 15,764 crore on modernization during the 12th Plan (2012-17). During the 11th Plan (2007-2012) the OFB spent Rs 2,953 crore on modernization and capacity augmentation. Over the last three years, the MoD has approved capacity augmentation projects for the OFB worth Rs 4,144 crore, for completion by 2015-16. New projects worth Rs 2,756 crore are currently being executed, while another Rs 2,400 crore worth of modernisation is being examined by the Department of Defence Production (DoDP). The defence budget for 2012-13 allocated Rs 906 crore to OFB modernisation, and the allocation for this year is Rs 1,029 crore. Does the military threaten democracy?